"A sweet and sour side dish that's really nice with pork, ham, or sausage. Tastes better on day two, and freezes well." Way to vinegary for me. I would cut the vinegar in half next time and maybe double the brown sugar - as I noticed on other recipes. This is absolutely wonderful! But... I prefer to add the apples after the cabbage is cooked. Otherwise the apples cook down and become pasty. The spices are perfect!! Thank you!! Just great! If you've never had it make it. Cut the vinegar in half and used balsamic vinegar instead. Put it in a crock pot on high for four hours. So good (great with the Sauerbraten). 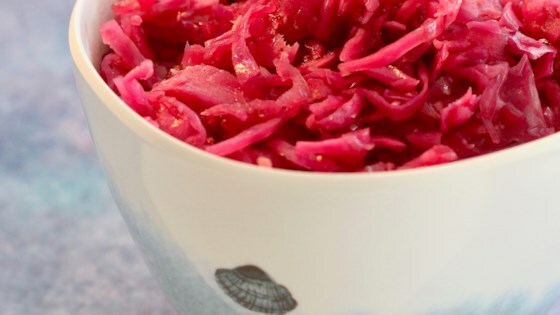 If you're anti cabbage-slicing: I used one jar of red cabbage (drained), 2 Granny apples, 1/2 cup of white wine vinegar and 3/8 cup of brown sugar. Mmmm...I will be making this one again.